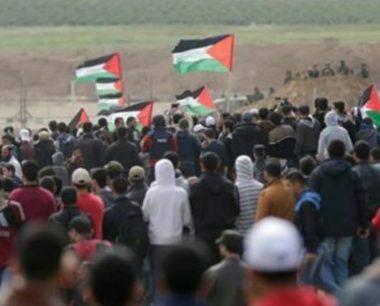 Israeli soldiers injured, Friday 32 Palestinians during the Great Return March processions, ongoing for the 45thconsecutive week, near the perimeter fence in the eastern parts of the besieged and impoverished Gaza Strip. The Palestinian Health Ministry said the soldiers injured 32 Palestinians, including a medic, who was shot with a gas bomb in her face, east of Rafah, in the southern part of the Gaza Strip. The soldiers also shot and seriously injured a child and a young woman, after shooting them with live rounds in the chest.